In the days before cloud computing, getting a CMMS up and running in a new location was costly at best, and near-impossible at worst, due to the time and effort that was required. Thankfully, with the advent of cloud-based CMMS technology, the ability to implement a CMMS at a new site quickly, easily, and inexpensively became a reality. A multi-site CMMS gives an organization the ability to operate multiple businesses, divisions, locations, or facilities from anywhere. The CMMS can be partitioned by site so that different users throughout the organization have different access rights based on their location. Whereas user group permissions determine access rights to functionality such as reports or settings, multi-site functionality determines access rights to asset and maintenance data in the CMMS. 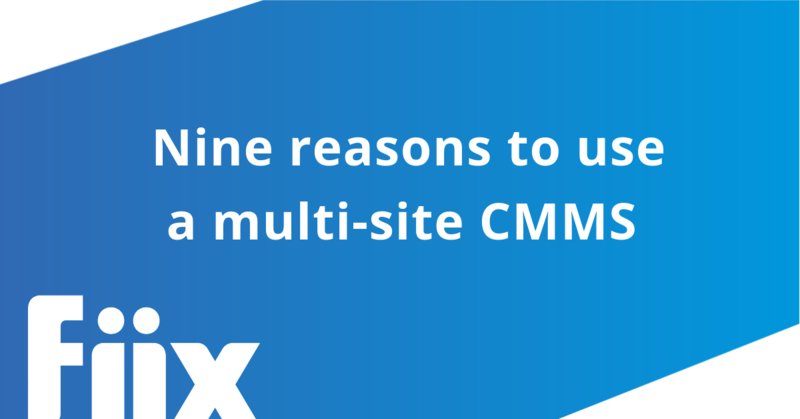 For an organization with multiple locations, there are a number of distinct advantages of using multi-site CMMS versus multiple single-site CMMS applications. The major advantage of using a multi-site CMMS is the ability to pull reports and real-time KPIs across all sites. This gives management the ability to view metrics for each site on one common dashboard, or compare sites in terms of CMMS user engagement and key maintenance metrics such as MTTR, MTBF, and planned maintenance percentage. Having a single CMMS gives the organization the ability to standardize the way of working within one CMMS. Users across the organization see the same screens, user-defined lists, dropdowns, configurations, and system defaults. Centrally controlled permissions mean the organization creates one technician user group that is shared across the organization. This means all technicians in the organization can access the CMMS in the same way at their site, eliminating the need to match permissions across multiple discrete systems. Similar to the previous point, a common CMMS gives the organization the ability to standardize the way of working across all sites. This includes workflows and processes within the CMMS. For example, the organization can configure common task groups across all sites, so the same tasks are performed on the same equipment at each site. Because the data in a multi-site CMMS resides in a single database, it is possible to view parts from all sites in one location. If one site experiences a stockout, it’s possible for a user to see if the part is available at other sites. It may be faster and more cost-efficient to ship the part from another location rather than paying extortionate last-minute prices from the supplier. Because of the single database mentioned previously, data can be extracted easily for analysis and comparison purposes. For example, it would be possible to pull Problem-Cause-Action data for one equipment type across all sites. This data could be used to optimize PMs, identify sites that need further training, perform FMEA analysis, or change the manufacturing process. When an organization expands and adds additional sites, new sites can be rolled into the CMMS quickly and easily. System configurations, user groups settings, user-defined lists, and more are inherited from the original setup. In addition, if the new site is adding similar equipment, the equipment and PM list can be copied easily from another site. Multi-site CMMS facilitates the transfer of knowledge across the organization. For example, if faced with an issue never seen before at one site, the technician can search other sites for similar issues and generate ideas to help speed up the repair process. A single CMMS with multi-site functionality makes life easier for the IT team in terms of applications to manage. In addition, only one admin license is needed to manage the system. In comparison, an admin license would be needed for each site in an organization running single site CMMS applications. Multi-site CMMS offers more flexibility when it comes to purchasing parts and inventory. Purchasing can be owned at either site or at the corporate level. A multi-site CMMS is the key to keeping your CMMS implementation straightforward across the organization. For those organizations that want locations to operate as separate entities, a single- site CMMS for each location is the preferred option. Setting up a multi-site CMMS: Which site do you set up first?